ToolGuyd > DIY Projects > How Much Does it Cost to Build with 80/20 Aluminum T-Slot? A couple of people have asked about how much it costs to build something with 80/20 aluminum t-slot framing profiles. Well, there are different ways to build with it. When I started, I bought bulk 8-foot long extrusions from suppliers when they ran coupon codes, and cut them down to size with a special aluminum-cutting miter saw blade. Then, I started buying different lengths from 80/20’s ebay store. Now, I order my extrusions pre-cut, directly from 80/20 or through a drop-shipping dealer. It doesn’t cost much extra, at least for longer extrusions. Ordering from 80/20 directly or through their ebay store, the basic 1″ x 1″ profile is $0.23 cents per inch, plus $1.95 per cut. So, if you want to order a 6-foot extrusion, it’ll be $18.51. 80/20’s shipping has always been reasonable. I have also ordered from MSC and Zoro. I had great shipping experiences from MSC, but not from Zoro. Let’s say you want a 58″ extrusion. It will be better to order a 58″ extrusion from 80/20 directly, than to order a 60″ extrusion and trim off 2″. When you order a 60″ extrusion, the “cut fee” is already baked into the price. But if you want 7x 10″ extrusions, it’s more economical to buy a single 72″ extrusion that you cut down to size, at least if you already have the tools and an appropriate saw blade to do so. If you were to order 7x 10″ extrusions from 80/20, you’d have to pay for 7 cuts. Since only 1 cut fee is baked into the price of the 72″ extrusion, that means you’re paying $11.70 extra to get 7 extrusions cut to the length you want them. A 72″ extrusion would be $18.51, and would yield (7) 10″ profiles. 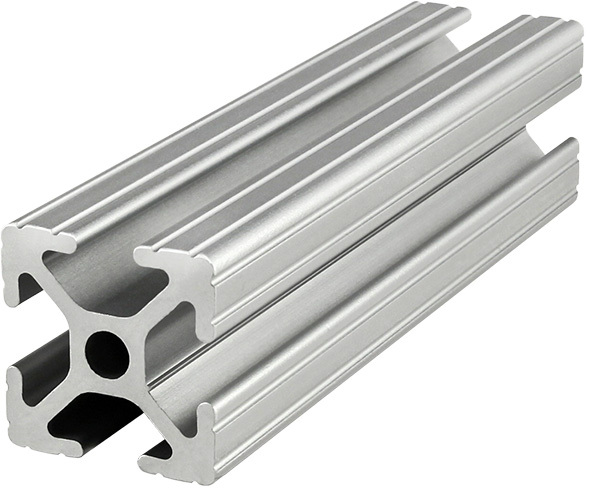 If you were to buy (7) 10″ profiles, the cost would be $4.25 each, or $29.75 total. So if you have a project that involves a lot of shorter pieces, you aren’t in a rush, and you have the right tooling or don’t mind buying it, it’s less expensive to start with larger extrusions, and cut them down to size yourself. The cost per cut isn’t a flat rate. For example, 80/20’s 3060 profile, which is 3″ x 6″ wide and priced at $2.95 per inch, has a cutting fee of $2.90 per cut. For larger profiles like that, you save money paying the cutting fee if it means you can save at least one inch. In other words, if you need two 10″ profiles, at $2.95 per inch, it’s cheaper to buy two profiles cut to length than to buy a 24″ length that you cut to length yourself. You save $9 buy paying for one additional cut instead of 4 inches of leftover material. 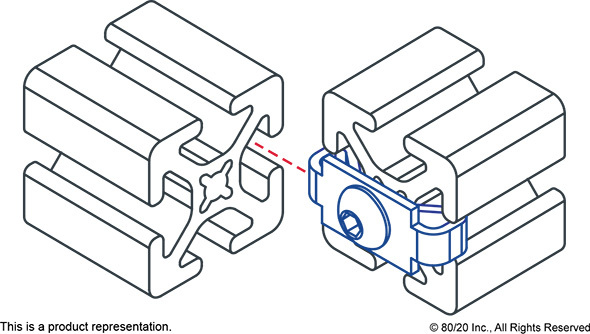 This is an “end fastener,” a common way of fastening 80/20 together. I don’t use this connection often, because it requires access holes. You tap the end of an 80/20 profile, drive the fastener in, slide the “wing clip” into another profile, and tighten things up. Without an access hole, there’s no way to tighten up the fastener. 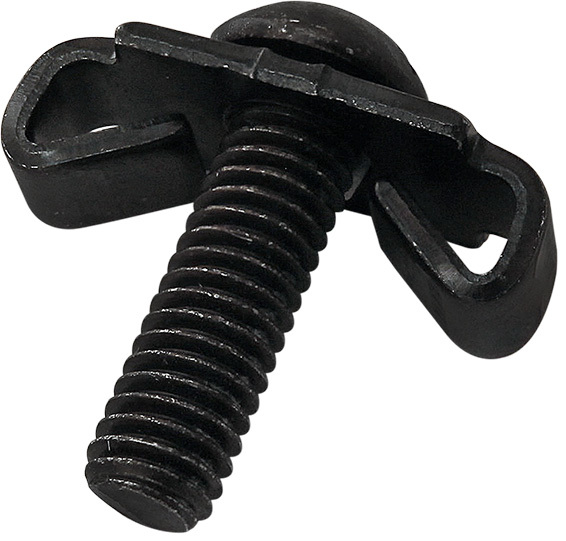 10-series end fasteners are $1.50 each. So, how do you drill the access hole? 80/20 has jigs that you could buy. I built a jig for myself, modeled off the 80/20 jig, or you could use a drill press or milling machine, if you can be precise and repeatable enough. If you don’t want to tap the ends of your profiles yourself, this is one of the standard machining services that 80/20 offers. For tapping the end of a 1010 extrusion to 1/4-20, it’ll cost you $1.95 per hole tapped. Access holes can also be done for you, at a cost of $1.95 each. I used different types of angle brackets for a while. They’re pricey, and so is the hardware, but they allow for easy adjustments and customizations, and are reusable. The bracket shown here has an elongated hole on one side. I use these with wood tops, or when I need hole spacing that is slightly off 80/20’s standard for 10- or 15-series profiles. Be careful, though. 80/20 recommends flanged button head socket cap screws for all of their external angle brackets and flat plates, but I have found that the angle fillet interferes with the screws’ flange heads. 80/20 wasn’t able to provide me with answers as to why this happened, so I started using standard button socket head cap screws for those instances. I’ve purchased economy t-nuts like these from suppliers, and sourced my own button head screws and washers. It can save a little money, but can be a headache. The brackets are pricey no matter what. 80/20 sells uncut extrusions, but it takes a lot of work to make your own angle brackets or fastening plates. And, when all is said and done, it’s still not the same because the DIY solution isn’t anodized whereas 80/20’s is. I believe they also do sell anodized profiles, but even if so, they will still require a lot of effort, machining, and finishing. 10-series 1/4-20 sliding economy T-nuts are $0.21 each. The matching screw is $0.30. If you buy them together, you get both for $0.50. 80/20’s ebay store has pre-packaged amounts, such as bags of 25. If you order from 80/20 or a dealer, you can buy any quantity. Let’s say you want a gussetted corner bracket for extra strength. They’re $3.95 each, and you’ll need 2 sets of fasteners, for $0.80. For this they advise a button head socket cap screw ($0.23) and a T-nut ($0.21). Or you can buy a 2-piece set for $0.40. Thus, for this one connection, it’ll cost you $4.75. BUT, you don’t have to spend any time, effort, or money to tap profile ends or drill access holes. Anchor fasteners are one of the strongest connections possible. There are even double anchors, which can be better for challenging joints. This 10-series anchor is $2.90. Plus, anchors require counterbores. I gave this a try a while ago, and it’s tricky to counterbore extrusions yourself. Well, not tricky, as much as time consuming. You have to have the right tools, you have the right tooling, and you have to be very precise. This is not the kind of operation you can perform with a handheld drill. 80/20 can machine the counterbores for you, at a cost of $2.25 per hole. So, for one joint in a 1010 profile, the cost is $5.15. So, let’s say you want to make a very simple table, with 4 legs 28″ long, and a square top 24″ wide x 24″ deep. Going with 1010 extrusions, the cost would be $53.69 (208 inches + 3 cut fees) just for the profiles. There are different ways to get the 8 profile lengths from 3 extrusions. If you go with pre-cut lengths, you’ll spend more on a few inches of material that won’t be used. If you order cut-to-size lengths from 80/20, you can probably go with 3 extrusions. Keep in mind that saw blades have measurable kerfs. A 48″ extrusion cut in half will yield two extrusions slightly under 24″ in length. If you order everything cut to length, (4) 28″ legs plus (4) 24″ top segments, it’ll be 208 inches plus 8 cut fees, or $63.44. So, cutting everything to length saves you nearly $10. If you have to add an extra inch or three, it’ll close the gap between price points ever so slightly. At 23 cents per inch, it takes a lot of unused 1010 extrusion material to balance out paying for an additional cut. Let’s say you go with end fasteners, at $1.50 each, and you do all of the prep yourself. So that means 4 fasteners for the top, and 4 for the legs. 8 x $1.50 is $12 in fasteners. Plus, you’ll need to tap 8 profiles and drill 8 access holes. That brings the cost up to $65.69 for the lowest-cost DIY process. If you go with the same end fasteners but have 80/20 do all the machining, that adds $31.20 in machining fees, on top of $12 for the hardware. The machining fees add up. So that brings it to $106.64 for the “bolt-together” solution. Shipping fees for both will be around the same. 80/20 is giving me a quote of $18.44. This is where, if you’re going the DIY route, you can save some money buying what you can from industrial suppliers. If you go with end fasteners, you save quite a bit if you cut your extrusions down to size, but really the bulk of the cost savings is in drilling your own access holes and tapping extrusions yourself. What if you wanted to go with basic corner brackets? The simplest 10-series 2-hole corner bracket is $2.90 each. The strong gussetted corner bracket is $3.95 each. Buying economy T-nuts and fasteners separately will cost $0.88 per bracket. Figure 4 top brackets plus 8 leg connections (2 per leg will be more stable), and that’s 12 connections, or $45.36 in corner brackets and hardware alone. To save costs and simplify things, 4 corner brackets can be used for the top, and 4 end fasteners for the bottom. That DIY solution would come out to be $74.81 ($53.69 for extrusions, $6 in end fasteners, $15.12 for 4 corner brackets for the top connections). Part of the fun (or tricky part) is about determining the best connection for your needs, without costing a fortune. If you wanted an all-anchor solution, which would likely provide the strongest construction, at least compared to the options previously discussed, it would require 8 anchors and 8 counterbores. That would be $41.20. This ends up being more economical than using even the least expensive corner brackets, and I’d guarantee it’d be stronger and easier to assemble. But, counterbores are permanent modifications. 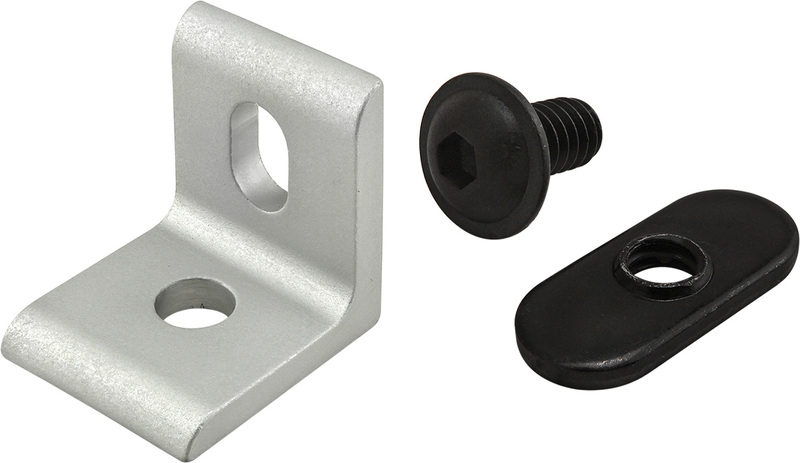 In the past, I went with angle brackets, and often combinations of brackets and plates, but I realized it was easier and in some cases more economical to go with anchor fasteners. So, to build a simple table frame, with 28″ legs and a 24″ x 24″ top, all made from 1″ x 1″ framing, the cheapest DIY solution I can think of would be $65.69, not including the tools or accessories to cut the extrusions, drill access holes, and tap end holes. The best “just bolt it together” solution would be $104.64, with $63.44 in extrusions and $41.20 in anchors and counterbore machining fees. 80/20 is expensive to work with, but it’s strong, durable, resistant to water and certain chemicals, and easily customized or adapted to different needs. I can make a similar-sized table out of (2) 2x4s ripped in half and cut to length, with either glue, screws, or both holding everything together. Spend a little more, and it can be made from knot-free 1.5″ x 1.5″ pine. Even then, you can probably make several small tables for the price of just (1) 80/20 assembly. I choose 80/20 when I can’t or don’t want to use wood or wood products (such as plywood). I don’t have the tools to work with sheet metal on the scale I’d need, and steel can be too weighty, impractical, or unsightly. Prior to moving, I built a simple 80/20 shelf stand that gave us some space above the TV for a speaker and miscellaneous stuff. It was black-anodized 80/20. It would have taken me a lot longer to make anything similarly functional and inconspicuous out of wood. I’m not advocating for 80/20, I’m merely trying to share some of what I learned about it from my experiences. It’s great to work with, and can provide quick solutions to lots of storage, fixturing, or guarding needs. Yes, it’s somewhat expensive to work with, but it is functionally a lot different than any other material I’ve worked with before. For those of you that asked for more insight into the pricing, hopefully this helps clarify things. For a real table, though, one would want to add stringers for stability, leveling feet, and brackets for attaching a table top. As discussed, costs would be lowest if you’re just paying for profiles and end fasteners. If you want stronger or more adjustable fastening methods, or you want to save a lot of time and effort, you have that option, but the total costs increase, and fast. For individuals, it can be better to trade time and elbow grease for substantial savings. But for those in business, research, or industrial settings, having a bolt-together solution can be the better choice. When you have 80/20 do the machining for you, all you need for final assembly are a couple of hex tools, and that’s it. Very useful! I wish you’d post this six months ago 🙂 it would have saved me a bunch of research! I use Faztek’s extrusion. I settled on 25” 1515 counterbored on both ends for the fasteners. I use these for height and depth and then 51.5” (25”x2 + 1.5”x2 plus an internal 1.5”) or 28” (25” + 1.5×2) for width. 25” + 4” casters has worked well height wise. Using a standard combination has allowed me to rebuild and tweak as I go. Yes counterbores are expensive and fixed but with some planning it’s never been an issue. I had to use a few brackets and end fasteners for inaccessible places. I have put my builds on Instagram – http://www.dusty.tools. I have a miter and Shapeoko CNC cabinet partially finished that I’ll post soon. With Faztek it is worth talking to their design team, it appears to get you a discount and the design is free. Whenever I talk about 80/20 there’s a lot of pushback because of its pricing, and so I didn’t think there was much interest. I’ll probably give Faztek a try in the future, especially if their lead times are a lot shorter than 80/20’s. Holy Crap! I saw some of this from another maker, on sale somewhere. Might’ve been Home Depot, or some other industrial site I research for my supplies. I’ve had someone ask me what it was for, and I had NO IDEA what this was used for. Now that you’ve gone into such detail I feel like a complete IDIOT for not seeing it this way! I thought this was used as shop equipment railing, for easy moving things around as you need it! Kinda like you’d orient the work tables to slide from one area to another using the front-facing side of the rails, and then your tools would be built into stands that slide up and down on legs made of these, and ride around the shop on the tops of the floor rails, to meet the tables you need. And the fact that they have the shape on all 4 surfaces meant you could have a system for the floor, and another for the ceiling, all intended to maximize the versatility of your bench area. I didn’t even CONSIDER it for simple self-made Ikea-Style custom building! My wacky idea would’ve been WAY too strenuous on this stuff! Stuart… YOU ROCK! Thank you for showing us what this stuff is for!! I had NO CLUE! And I MEAN that!!!! MAN I was an idiot! Sorry… Fastenal… That’s where I saw it… Fastenal… I was totally clueless… This stuff is pretty darn cool!! After the previous post, I looked into 80/20 a bit closer. It is a no brainer in an industrial and certain commercial settings, machine shops, where you can rapidly build custom solutions in house and get great payback … or on a small setting have large enough project where you have to build some solution, that will be broken down and reused elsewhere later. I love things on wheels and things that can adapt to changing needs, but once one has a certain mass of tools and supplies; or whatever one needs to store … how much does it really evolve, when most hand tools are a certain size? Bins are bins. Drawers are drawers. Every time I see that great drawer cabinet build photo, I think it looks very neat, cool and solid …….. then I’m curious what it cost in rails, extra hardware, fasterners, drawer slides, wood drawers, time, … and it still ends up being open storage unless finished further. No matter what you make them out of, it’s not cheap. I’m making a single 28” tall cabinet to mount on the rolling platform for a floor mount drill press. Small cabinet with 5 drawers (figure $25-35 per drawer including hardware for any build). I bought pre-milled 1/2” poplar for the drawers, 1/4” and 3/4” precut 2×4’ sheets of ply (don’t have a truck and the panel saw at the store was broken), 5 16” full extension B.B. drawer slides and some edge banding. Let’s say it was $250 all in, buying full sheets of ply and milling the poplar myself and buying the slides online, maybe I could have brought it down to $175? I’ve probably spent 8-10 hours so far. I waste too much time fetching misc tools or finding parts and tooling and machine set up and test cuts. All the parts are cut, still have another 8 hours in some finishing touches, glue and clamp, sanding and finishing and mounting the drawer slides before it gets put into service. If I was more efficient, maybe 6-8 hrs? Gods knows nobody would pay me by the hour to do this stuff! But, it fits a specific need and space for which I’m unlikely to find a ready to use solution. Now for comparison I bought a harbor freight 8 drawer rolling tool chest earlier this summer for $230. 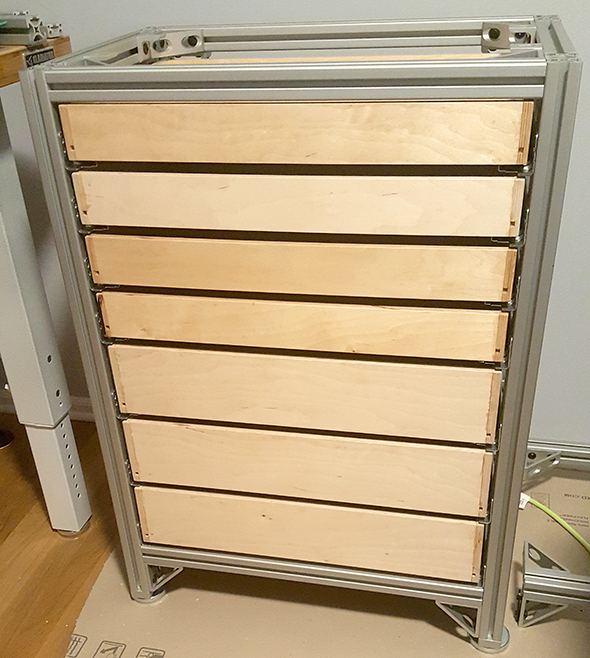 2 hours invested to drag it home, install the wheels and handle, but I still have to pull the drawers and figure out why the drawer locking is jammed up, so maybe one more hour for that. For what it is worth after the fact. The last time I was in the big box store to get a sheet of plywood cut down and ripped into quarters, since that is way cheaper than buying their pre-cut “handy boards” or whatever they call them, the panel saw was out of order and I thought I’d have to resort to buying 4 1/4 sheets (which is far more expensive than getting 1 sheet ripped down). I went over to the customer service desk and asked if I could buy four 1/4 sheets at the price if a single sheet since their saw was down. They happily gave me the lower price. So if you run into that situation again, it doesn’t hurt to ask. That’s what’s great about this stuff – there are ways to cut costs. If you have the tools and expertise, you can save money in exchange for time and elbow grease. If time is more valuable, you can spend more and only have to assemble everything once it arrives. Indeed, pricey. But there is the idea that for industrial and commercial solutions it could make real sense. Light weight, modular, etc. Different parameters. Time is money and if your skilled labour is spending half the time lugging and setting up tool carts, tools stands, and other items, then a contractor or maintenance organisation is saving $$ per hour. It adds up. To them, it amortises itself rather quickly. I could see this product being used as the basis for an outstanding portable mitre saw platform. Home use? Not so much(in a practical dollars vs sense way) but the same could be said of using Festool power tools. Do most homeowners or even serious woodworking enthusiasts really need that kind of precision and modular dust control? Probably not. That does not mean they don’t want it or do not put it to good use. More like if you want it, do it. I do wish it was more approachable in price but I love the concept and applications. Workbenches and carts are high-cost applications. Let’s say you want an adjustable garden tool hanger. Mount an extrusion or two, add accessories, and it’s ready to go. Larger extrusions can be used for pressurized air! Cap the ends, add outlets where you need them, and it’s a manifold. 3 years ago, a tour of Milwaukee Tool’s HQ took us to a masonry tool/accessory test lab, and they had an 80/20 air supply setup like this mounted to the wall. Wow. I would have never thought of an air manifold. That is neat. I love this kind of ingenuity. I love your passion about things ,you love,. I do wish more tools saw the same depth and detail along with a long term review. Running and buying thousands of dollars of cordless tools for 3 framing companies,each with their own preference, Makita, Dewalt, Milwaukee…is a challenge to stay on top of expenses and what tool produces the best results. Obviously I use multiple sources to accomplish this.I regard Toolguyd as a valuable part of that goal…I appreciate the hard work you put into the blog. In no uncertain terms, I am overloaded, and overwhelmed. There’s a rhyme and reason to things. Right now, I’m still working on workshop setup. We moved 2 years ago, and I never had a chance to set things up. I just “made due,” wish small steps here and there. It has been a huge hindrance, and I’m taking the time to get things done. Since my workload won’t ease up, I have to be more efficient. And that means being able to find what I need quick, being able to use tools with minimal setup, and being able to take photos without having to dump the contents of a benchtop onto the floor, which I’d have to clean in order to do something else next. I don’t take vacations, but I’m hoping to spend a lot of time in September to make better progress. Then, I’ll be in full workaholic mode in Q4 as usual, and then hopefully by January I can create a fuller editorial calendar for 2019 that actually knocks more off my to-do list than is added on. 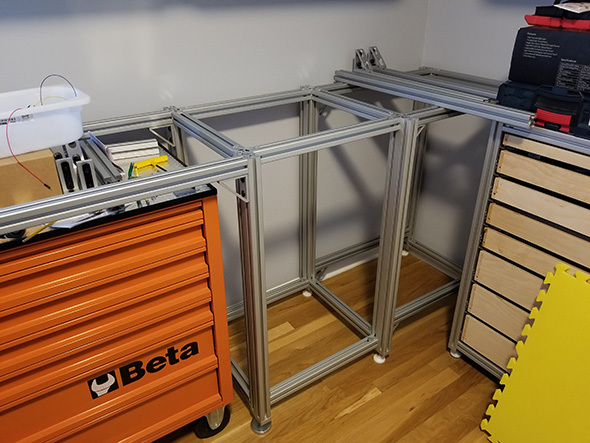 I posted about my recent progress the other day (https://toolguyd.com/workshop-storage-progress-my-industrial-bin-rack-is-coming-along/), and it resulted in questions that I then wrote this post to hopefully answer. The hard part is that I planned to “DIY” and document a lot of my solutions, but I simply don’t have the time. The fact that I’m not fully efficiently set up by now proved that to me. 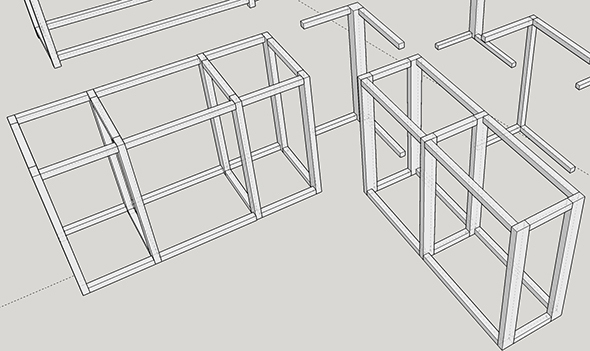 So, I’m responding appropriately (better late than never) and going with bolt-together and pre-built options, at least for cabinets and similar where I don’t have anything in place. Long story short, I’m taking a little time now to focus on operational needs, in order to be better and more efficient at both project progress and review testing. Because of that, there might be more posts about such topics while things are fresh. But I have every intention to return to full thoroughness and speed. To be fair, I could never be as thorough with certain tools as I could with others. In other words, because of my familiarity and experiences, a review on a heavy duty rear-handle saw might not be as thorough as a review of a standard circular saw, even once my workspaces are fully up to speed. The workspace setup process would have been a lot easier 10 years ago when I could fit all of my tools in a couple of cabinets and wire shelving units. Now? I am capable of doing a lot more, but that also means there’s more to store and organize. And that’s not even talking about samples that I’m backlogged on and taking up space. Once I’m more efficient with my own equipment, I will be working through the backlog as fast as I can, partly so that I can donate them as fast as I can. I like the look of these extrusions, but I wonder if that geometry is really necessary. Creating things out of standard square and angle stock may be more cost effective, and perhaps more sturdy. 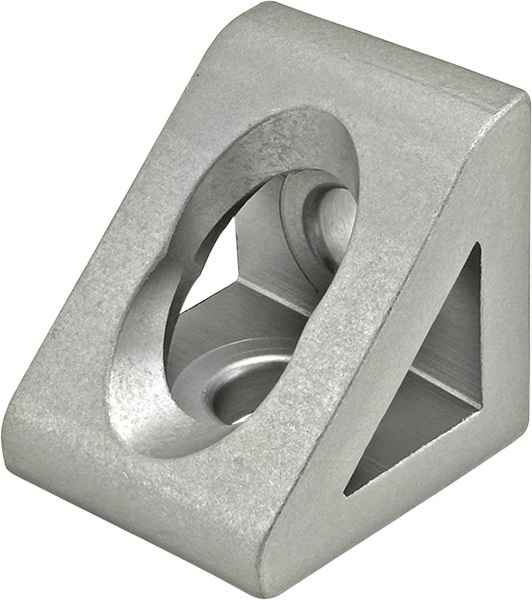 304 stainless steel angle stock 1″ @ 1/8″ thick runs $.40 an inch which is more expensive, but considerably stronger. The equivalent size in 6061 aluminum runs a third of that. True. But what happens when you want to add leveling feet? A table top? Drawer slides? And then you want to change the height of the drawer slides? There are lots of other options, many of them great choices, sometimes even better choices. I’m not saying this is the perfect material for every application. I personally like using it because it’s a problem-solver. If I need to add leveling feet, I can tap the ends of profiles. If I want to use larger leveling feet, I can buy a foot base that threads into wider profiles. If I want to use a panel, I can slide it right in, or quickly modify thicker plywood or panels to fit. For me, it’s a problem-solver where I don’t always have to figure out every aspect of a design. It lets me design custom solutions where store-bought solutions might not exist, or might not be perfect for the application. If the geometry isn’t necessary, there are other solutions. I haven’t used it, but 80/20 also offers a “quickframe” product. https://www.8020.net/university-quickframe The basic profile is 13 cents an inch. Good points , and I get the feeling that costs will drop as these modular systems catch on. That said, I can definitely sympathize with your position. I have recently taken on a new position and I will need to efficiently use my time if I am to succeed. I have been in situations with tight deadlines before, and one of the best things to do in those situations is to evaluate what the people paying you are really trying to accomplish. Oftentimes, middle or even upper management will be unclear about their goals and be prone to dispatching their employees on wild goose chases. In these situations, getting in contact with key decision makers and understanding their vision can save you a lot of time and effort. I know it sounds like a cliché, but good communication is vital to a project’s success. I don’t think so; as demand increases further, there is no incentive to lower prices. Lead times are getting longer due to high demand, popularity, and order frequency. Also, these are also industrial products, where price is not often as big a consideration as with consumer products. This isn’t a comment specifically for this article. I’ve been trying to send Stuart a message through the contact page but it isn’t working for me. I’ve tried from both my iPad and also from my laptop. Both times I just get the spinning thing after I hit the send button. Not sure if this is a bug or not. nybody know their direct e-mail so I can bypass the page? Looking at your email address, you might be triggering a spam filter. Try your real email and see if that works. Stuart, funny thing, that is my real email address. It started out as the spam one but I don’t get spam on it so it is what I use now since the one with my name gets tons of spam. Wow. This is basically what Salamander A/V furniture is made out of. I could built my own Salamander furniture for a fraction of the price! One of the best cost benefits though, is the ability to reconfigure, disassemble to move, etc. If you are like me and constantly upgrading equipment in the shop, reorganizing, experimenting, or changing shop setups for large cabinetry jobs, the ability to knock it down or take it apart and integrate into the next build is a pretty valuable feature, with wood and standard cut and welded steel, the cost is mostly wasted for the next arrangement and it definitely isn’t very adjustable. Just my $0.92 per linear foot! Where I work, we use aluminum extrusion extensively for both machine frames, worktables, and machine guarding (paired with lexan sheets). We have a fairly extensive 3D library of Bosch profiles and components, which makes designing up a frame nearly as fast as designing a welded table. The flexibility of having slots available throughout a machine makes mounting sensors, doors, gate switches, etc much easier than doing so on a fixed welded frame. There are drawbacks to extrusion, beyond price (though these are mostly limited to industrial applications). In my workplace, welded frames arrive from our fabrication department machined, powder coated, and ready to have tooling assembled to them. Extrusion arrives as a kit, requiring the machine builder to play with an erector set for up to several days. If a machine is automated at all, we design around welded steel frames with machined keyways and dowels, ensuring consistent locations if tooling is ever removed for maintenance. This isn’t nearly as robust with extrusion designs (though that isn’t a concern with work tables). Thank you, told me everything I needed to know. I looked into it a bit and thought about doing the cutting myself thinking it would save money but the reality is I’m better off using something else. I sort of thought that but it’s good to confirm suspecisions. curious thought however – if you were to make a jig, use say a forstner bit could you reasonable make your own counter bores with a hand drill? I ask this because as I was installing a storm door the other day it had me drill though the AL frame with a forstner bit (1-1/4 inch I believe) to set the hardware since it wasn’t pre-drilled. granted it took a bit of a firm grip to hold it all still but powered right though. So I thought it might be possible for a few holes to do a hand held drill counterbore in the 80-20 stuff. Realistically, it could be possible, but one would need a drill bushing, and probably a counterbore drill bit, at the least. I have been using the ReadyTube (15 series) to build a couple work bench frames. I agree the initial upfront costs can be high. Watch eBay for used materials. A plus side, is its configurability and the ability to reconfigure as needed. 1. Over 8,000 compatible, tested products. Most other brands have less than 500 or 1,000 – forcing you to mix and match to build anything complex and that causes compatibility problems down the road. 2. 80/20 is all made in the USA with a tight tolerance specification, and they have very high quality anodizing (much of it is done in-house in large tanks). Batch-to-batch quality is very important to our long-term business. We can also get the kits with tagged bars that makes reading the Bill of Materials easier. 3. Although we stock over 3,000 80/20 bars and parts in San Diego, 80/20 stocks all 8,000 items in Indiana. So when there is a problem, it can be solved quickly. No waiting for the next shipping from the extruder, etc. As a few people have noted, 80/20 is not the cheapest t-slot aluminum extrusion product line around. Basically 80/20 and Bosch are the Coke and Pepsi of this industry, and everyone else is basically a copy (as there are virtually no shape patents in this industry). Every company outside of Bosch and 80/20 will offer aggressive discounting to get you to try their matching t-slot extrusions, and deals can be had – that is for sure. Some are pretty good, some not so good. We see the good, the bad and the ugly. But we do get a lot of customers coming back to 80/20 after crappy service, crappy anodizing, long-lead times, goofy shapes that are not really compatible, etc. from lower-end manufacturers and importers. So just know this going in. If price is your #1 priority – then off-brand t-slots is probably a good idea. If you look at the 80/20 website – you will only see full MSRP pricing and most of the ebay garage is the same (just cancelled online orders). If you really want a good price on genuine 80/20 bars and parts, you can work with a local distributor/manufacturer like us and we routinely offer free CAD design AND discounts to our customers – even small DIYers. So when people say 80/20 is expensive, see if they are talking about the List Price or the Street Price (the price you can buy it for from a top distributor, which will be lower). Most of the small guys don’t have distributors and you have to buy direct, so you will probably be dealing with a single US location. In summary, there are reasons to buy the better brands of aluminum t-slots, and we abandoned cheap knock-offs long ago to avoid letting down our customers. If you just need 1 or 2 bars and a few parts, you can definitely find imported extrusions from China or knock-offs from ex-80/20 employees for a lower cost. And they might work for you and you can save money. I get that. But if you are using them for expansion of your manufacturing facility, adding automation to your business, building that showcase enclosure for your home router or reselling framing as part of your core product, I would recommend building a relationship with quality distributors of either 80/20 or Bosch. That way, you know you will be getting the highest quality framing…and you can focus on other things and not worry about framing. It may cost you 5 – 15% more in the long run, but you will not regret it. My 2 cents from an insider. Trying not to make this a sales pitch but I did want to weigh in why we don’t use imports or knock-offs – even though they are cheaper. Our company is F&L Industrial Solutions in San Diego, if you care to look us up. Thank you for sharing your insights and experiences! !